The Silicone BasicOne Keyboard from Indukey features a completely closed silicone surface that offers an IP68 protection level from liquids and dust. The fact that these keyboards can be fully disinfected or washed (even fully submersed) makes them an ideal solution for environments with high hygienic requirements. The compact 84-key layout provides access to all basic functions and includes an embedded numeric keypad. The BasicOne is just 11.25" wide which also makes it a good solution where space is limited. 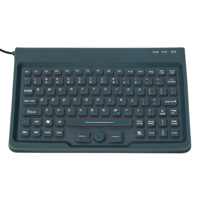 The 0°-70° operating range means that this keyboard can work in the harshest of environments. The BasicOne Keyboard uses a low travel (2.2 mm) patented Scissor Switch Mechanism with mechanical contacts to provide clean crisp tactile feedback and reliable activation. The activation force is higher than traditional keyboards, as is common with sealed keyboards. The 102 gram force ensures that users receive clear notification that the key has been activated, an important factor in the settings in which these keyboards will be deployed.